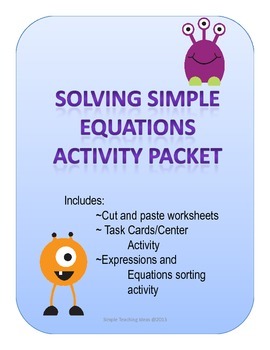 I prepared this activity packet for my special education students when learning equations for the New York State Alternative Assessment. The packet includes four different review activities to review equations. 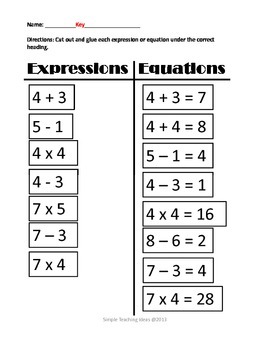 The first activity is a cut and paste sort of expressions and equations. Students cut out the expressions and equations and glue them into the appropriate columns. 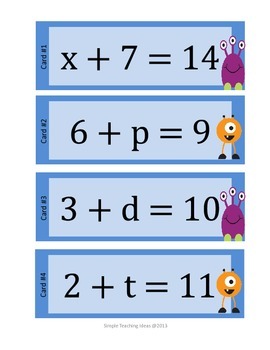 The next two activities have five equations on each page. The first page is all addition problems (x + 9 = 10; 9 + x = 10). 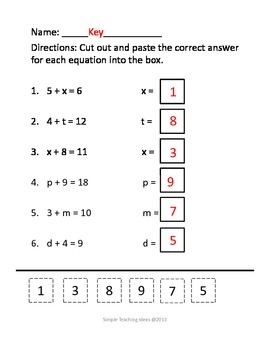 Students cut out and paste what x equals into a box. The second page is similar except all equations are subtraction (x - 9 = 10; 9 - x = 1). Again, students will cut and glue the correct answer into the box. The final activity includes task cards in a center type set-up. There are sixteen task cards, eight with addition, and eight with subtraction. Center is colored and an answer sheet and cover page are included. Packet includes 16 pages total and there are answer keys for each activity.